Significators | Where to stick them! Don’t sweep me under the carpet! Back in April, I ran a little poll asking YOU whether you’d consider using a significator in a reading. As I expected the majority of you said that you never used it in a reading, but an encouraging 20% said that you might consider using one now. Anyyyyywaaaay – so far we’ve looked at lots of ways one might choose a significator – some complicated and others very simple. But what to DO with the damned thing once you’ve got it?! 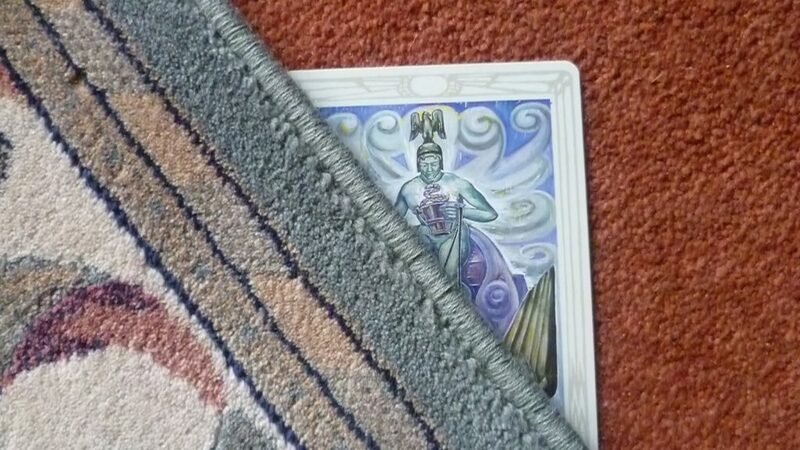 Traditionally with the Celtic Cross reading, it would be slipped beneath the first two cards of your spread, hitherto never to be referred to again! Well, what’s the point of THAT?! How could we make better use of this card? Why not try keeping the significator off to one side, somewhere where it can be kept in view throughout the reading, and then see how that card ‘relates’ to the other cards in the spread? In a circular-shaped spread – eg a Wheel of The Year type lay out – you could sit the significator in the centre. Literally placing your querent at the heart of the reading – and see how the card reacts to the others in the spread? Is the Significator and the card you want to talk about from the same suit? Or are they from suits where the elements are opposed (eg Wands and Cups, Swords and Pentacles)? Is your significator looking towards the card under discussion? Is the character in the OTHER card looking towards or away from the significator card? Is your significator looking to the left or right? Straight out? Does the significator mirror any aspect of the card under discussion? Are there any symbols common to both the Significator and the other card? I like that idea, Chloe – reading the cards around it as an answer. May I borrow that as a suggestion on an upcoming blog post? The only way I ever tend to use a significator is to find "where" the person is right now and where they need to go. So, choosing a significator, shuffling it into the deck, then looking through the deck to find it and reading the cards around it as an answer. I've also a Major as a significator, describing the main life lesson the person feels they are currently exploring 🙂 I like what you say about keeping the card within the reading to look at how it onteracts with the other cards! Grin, I read you whenever you post so stick to your schedule, darlin'! You know I'm a huge fan. Oh! If you have time, pop by mine tomorrow. I'm asking for input on a reading I did for me. It's a spread in which the use of a significator is integral – so lots of fun! There are loads of different ways to select cards as significators. If you have the time, if you check the posts that I made in April (you will be able to see them if you click the Blog Archive arrow for April) that outlined a few ways to select them. Glad to hear that you might consider using a significator in your readings! I have never used a significator in my readings but I can consider it. As far the point remains how to choose the significator, how about we take the court cards out, shuffle them and randomly pick one, and that is what is significator. because most of the times we are having different sides of our personality apparent which makes it difficult to decide which card best reflects those sides of our personality. I'm sure I'm not the only one with a multiple personality syndrome LOL but I am Queen of Wands but I have lots of Earth (Virgo Rising, Taurus Moon, Capricorn Stellium) so I don't know sometimes its the fire, sometimes the Earth which dominates. Can we do that?